Today Panic announced the release of their new iPad app, Status Board. I was fortunate enough to have the opportunity to spend some time with it before its release and I can confirm what most of you probably already anticipate; it’s a phenomenal app. I’ll spare you another review, because there are already great ones to be read elsewhere. But there are a couple of features in Status Board that I wanted to talk about. Ones that I think have a tremendous amount of value and potential. The first feature that I’m really excited about is HockeyApp integration. 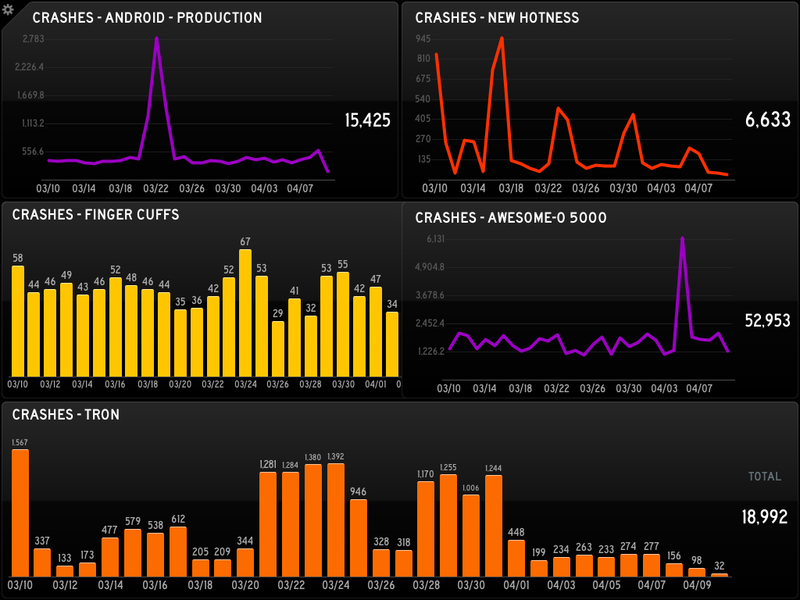 One of the widgets available in Status Board is a custom graph. 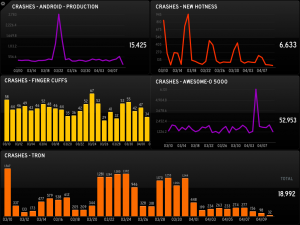 HockeyApp has made it incredibly simple to pass URLs from Hockey to Status Board which will feed your widget the data necessary to chart a graph of your crash numbers. You can fit up to 6 different graphs comfortably in Status Board’s landscape orientation, and up to 8 in portrait. I’m hopeful that daily crash numbers are just the beginning. The HockeyApp API offers a lot of useful data, and the data you can graph in Status Board is really only limited by what people decide to make scripts for. This leads me to the second thing that I’m excited about. Status Board also has widgets for custom tables and do-it-yourself panels. Combined with the custom graph widget, there are countless possibilities for the data and information to be displayed in Status Board. I have a suspicion (or possibly more of a hope) that a lot of users will quickly see different scenarios and opportunities to create scripts that will populate interesting and useful data for various widgets. Maybe the number of builds they have each day, or GitHub pushes, or Pivotal velocity, or bugs closed in Lighthouse. The list goes on and on. I’ve already seen a number of people on Twitter getting excited just thinking about the possibilities. As developers create tools to generate data for their own widgets, I hope they’ll be kind enough to share them with others. Before long we may have a laundry list of tools that you can use to create entertaining and helpful widgets for your status board. So with that, I encourage you to go check out Status Board if you haven’t already, and get cracking on one of the first must-have dataset generators for Status Board. Update: Chris Patterson has already gotten the ball rolling over here.